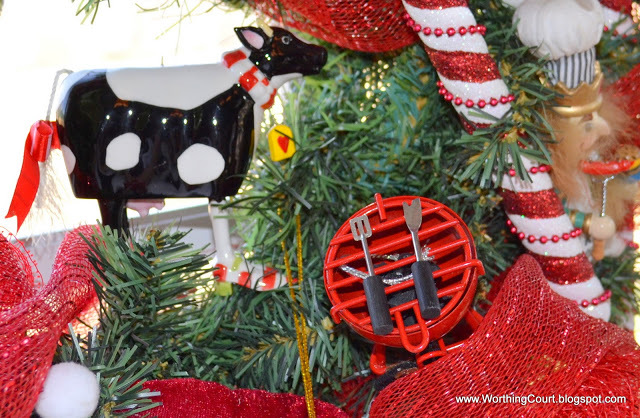 We’re continuing the Christmas tour of Nancy’s house in her kitchen today. Nancy’s kitchen is such a cheery, light filled room. There’s a bay window in the breakfast area and windows across the back that look out over…oh wait…what am I doing???? I almost forgot that I’m only giving you a little peek into her home right now. You’ll have to wait until later for the rest! 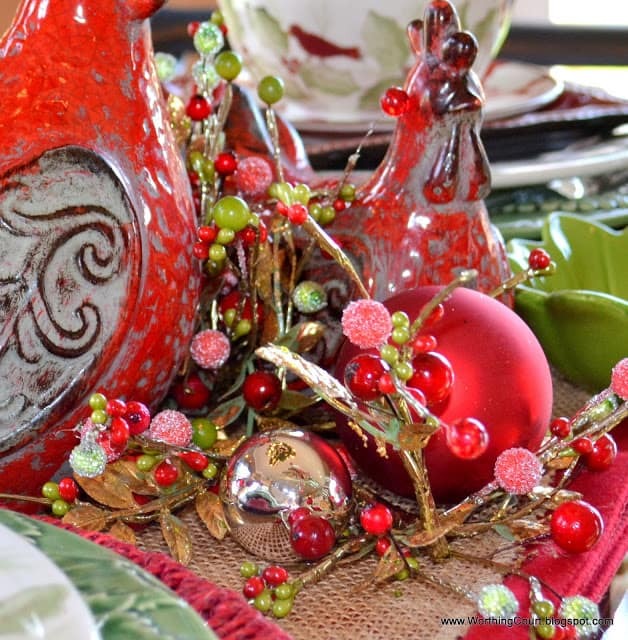 The kitchen table is all set for Christmas breakfast. Willow House. She better watch out – it just might disappear along with her front door wreath and the skates on her mantle! Here’s a picture of it from the Willow House website. I want it! 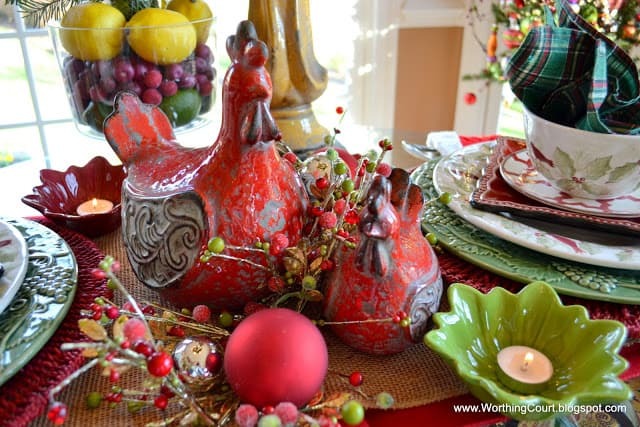 I love the way that Nancy incorporated some of her roosters into the Christmas table setting. 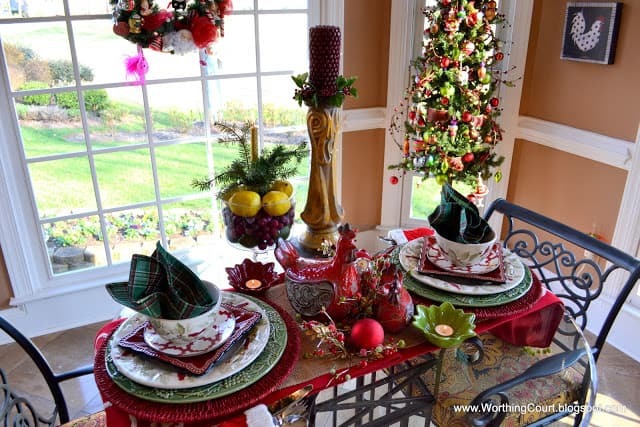 The mix of wicker chargers, burlap, berries and frosted and shiny ornaments adds great interest and texture. The stacked dishes are so, so pretty! 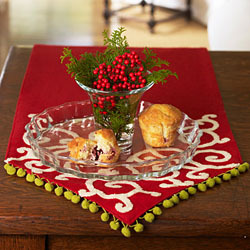 Pretty Christmas plaid napkin tucked into the bowl. 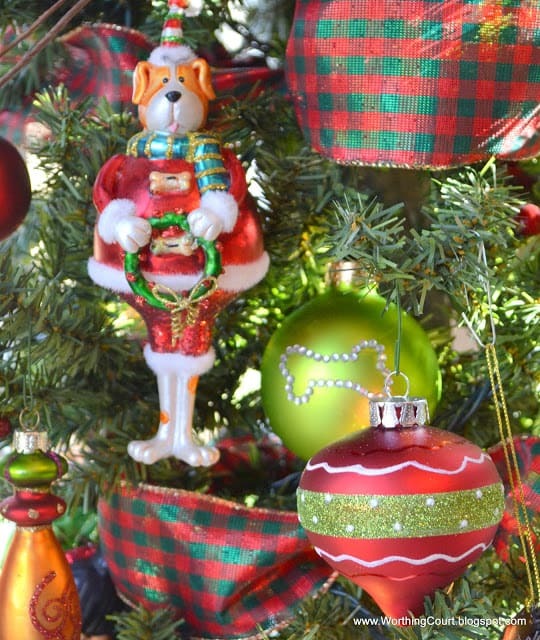 The cute tree is decorated with a dog and cat theme in mind. Here’s another one of those hats! 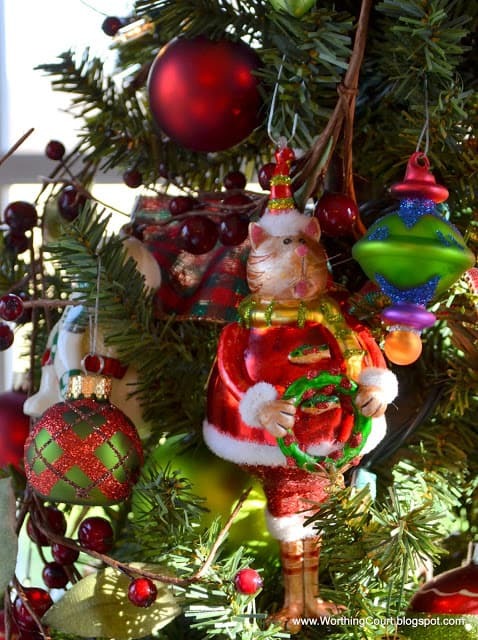 Remember the green one on the tree in her living room? Here kitty, kitty! Did you notice the fish buttons on the kitty’s jacket? The puppy dog has bone shaped buttons on his jacket. Gah! So stinkin’ cute! 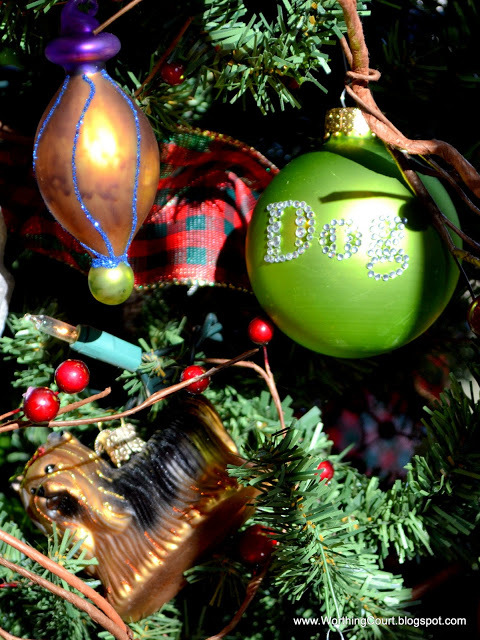 The yorkie ornament is for her baby, Natalee. 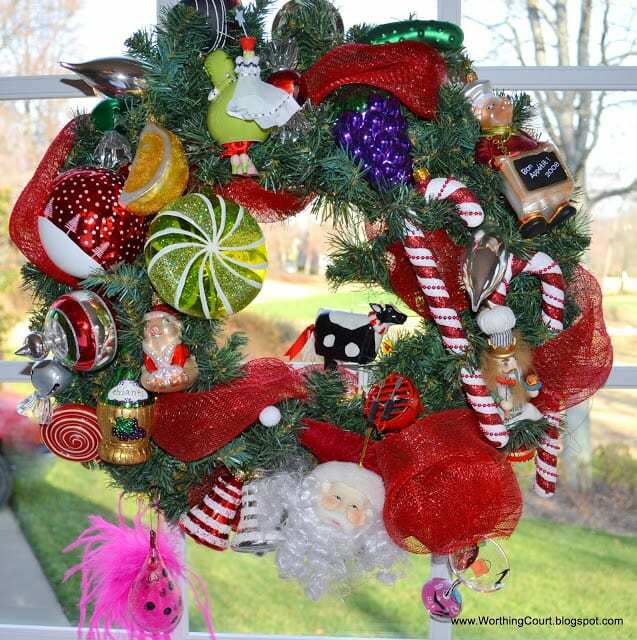 A wreath filled with more cute ornaments hangs in the bay window. I like the positioning of the cow right next to a grill. 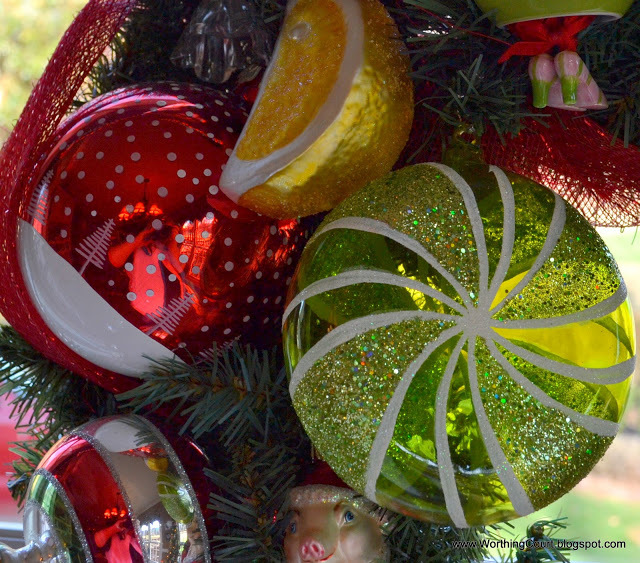 And last, but not least, these citrusy ornaments make my mouth water. Come back on Thursday when we’ll get a peek inside Nancy’s fabulous office! 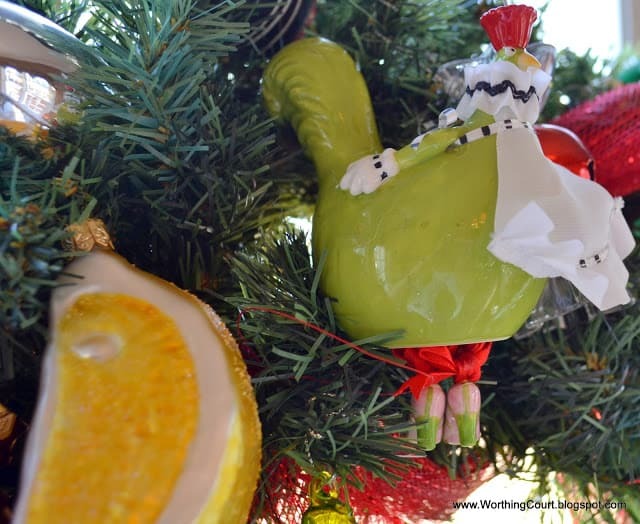 In case you missed it, you can see Nancy’s outdoor decor here, and the living room and dining room here. I am a Willow House consultant and fell in love with that runner too! It’s gorgeous! Did you get it on sale? I really like the kitchen! So many darling ornaments..love it all. Gotta find one of Frosty’s top hats. CUTE! Please thank Nancy for sharing her beautiful home, and thank you for taking us “on tour”. I am loving seeing all these pictures. It keeps me occupied while I am standing in line waiting for THE WREATH!! 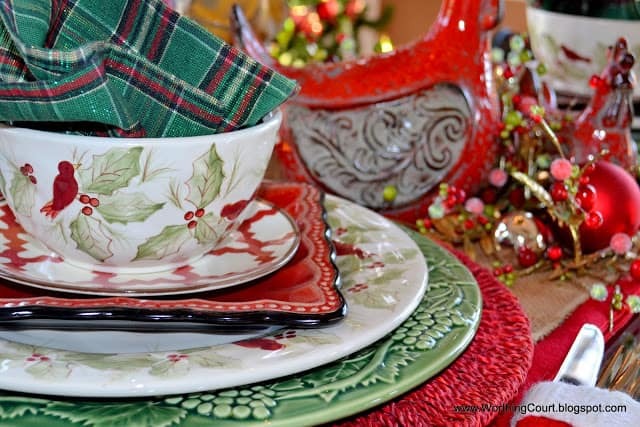 Love, love, love the plate stack!! Gorgeous plates! Merry Christmas! Beautiful! 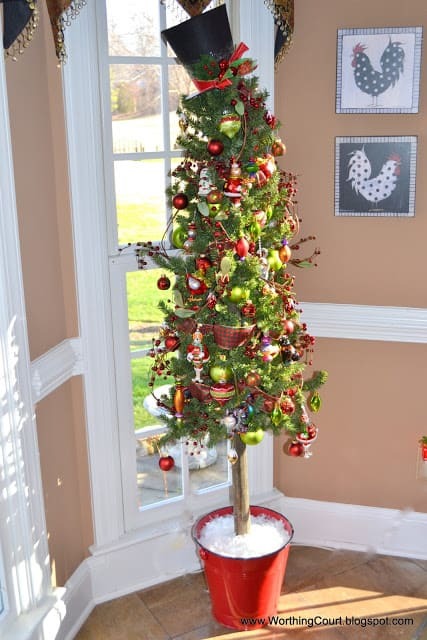 Love the tree with the hat topper! And that runner is gorgeous!!! It is all so cute. I wonder if she realized the cow was next to the grill. 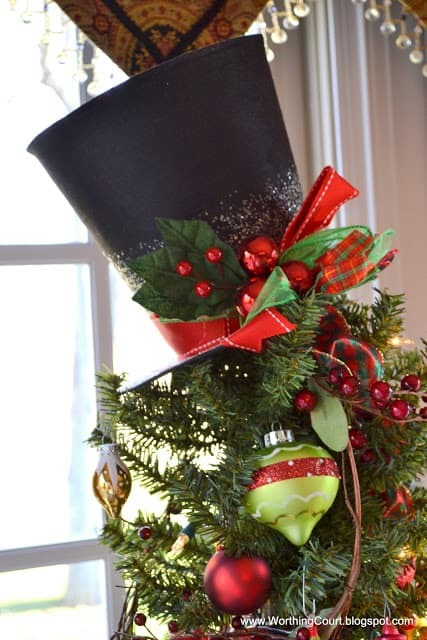 She has the same top hat I do and on her tree. Can’t wait for more. 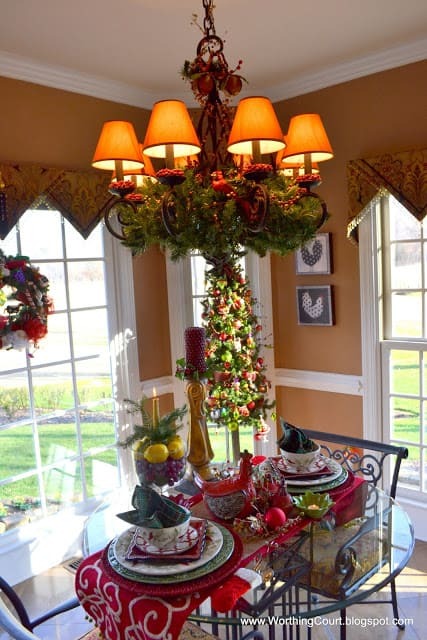 What a great tree and I absolutely love those dishes! 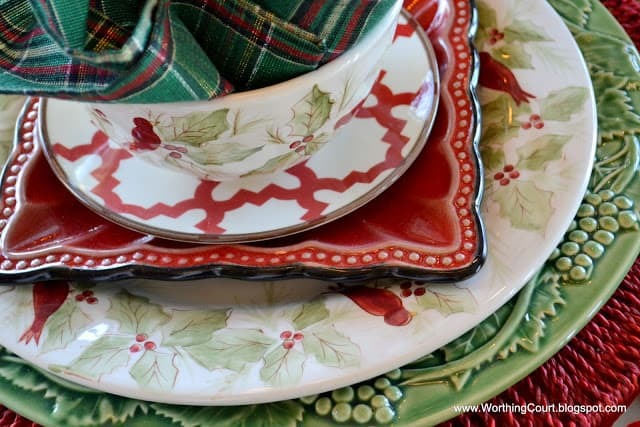 Great post, I love your kitchen and the runner is beautiful! 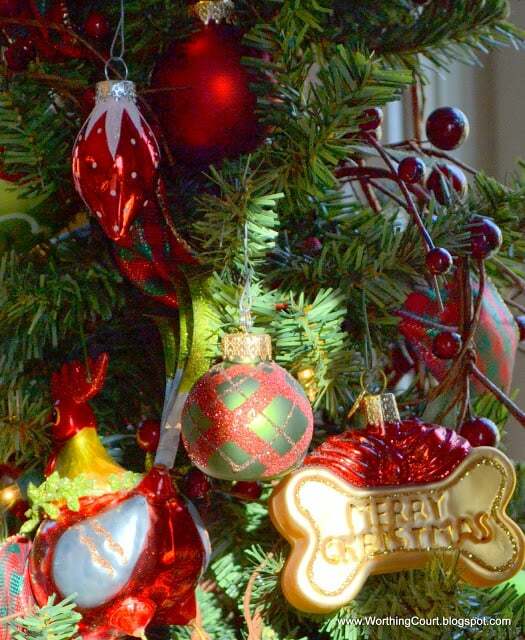 Thanks for sharing such gorgeous photos of the lovely Christmas tree. Wishing you and yours a wonderful Christmas. You have so many interesting things to look at. Love the table, dishes, tree well quite honestly everything. So fun to come visiting. What a lovely blog you have! Such great ornaments. i’m starting to hate Nancy just a wee bit for all of her cool stuff. :0 Just kidding. Thanks for sharing and have a Merry One. Wow! Such a beautiful kitchen all decked out for Christmas! I love the dishes.